Age: Adult (contains a little swearing, plenty of violence, some ritual sacrifice, a touch of sexual harassment, a fair amount of discrimination against mythical creatures and a highly illicit relationship with a water cooler). ...until you discover you're being bled dry to power a mystic portal to a fantasy realm. Lost in the basement with an IT troll and the tea lady, you must fight your way through the building in an epic quest for survival, revenge and someone to sign your timesheet. Comments: There's obviously something in the air. On almost the same day I posted my Choose your own housedad adventure, this book was released - another tribute to interactive gamebooks which young geeks the world over were thrilled by in the eighties. The Warlock of Firetop Mountain was the first of the Fighting Fantasy series of books - easily the best series in the genre. I remember it being fantastic. I spent many hours flicking between numbered paragraphs and rolling dice in an effort to reach the warlock's treasure. It was months before I realised there were in fact TWO keys labelled '111' and I was able to finally get to Paragraph 400 and the good ending. 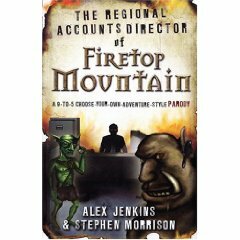 The Regional Accounts Director of Firetop Mountain (RADFM) does an excellent job of capturing the style and format of the old Fighting Fantasy books. Once again it's time to decide whether to turn left and go to Paragraph 179 or turn right and go to Paragraph 213. You have Aptitude, Endurance and Luck scores which, combined with some dice rolling, determine the outcome of fights and tricky situations. It's all very nostalgic and the line drawings are spot on. There are plenty of amusing jokes about temping, fantasy and gamebooks. Some of them are laugh-out-loud funny. References encompass everything from The Lord of the Rings to Twin Peaks. It's an essential gift for every World of Warcraft-loving corporate slave you know. By laying into both Fighting Fantasy and office culture, however, the book loses focus slightly. Fewer mythical creatures might have made the digs at cubicle life sharper. There's also a possibility the adventure itself might have been bettered structured. As it stands, RADFM is a rather linear progression of encounters with invisible co-workers and photocopier repair gorgons and similar beings. Many of the decisions are only a choice between continuing onwards or suffering instant death; most of the rest are of no consequence as both options bring about the same result within a paragraph or two. There are only about three occasions where a player decision takes the quest on a significantly different path for any length of time. Although the book has simple rules for creating a character and rolling dice to decide fights, it quickly becomes clear that the adventure is nigh on impossible to complete without cheating. At one point early on, it's quite easy to die three times in half a dozen paragraphs thanks to a poor decision, an unlucky dice roll and an uneven (and entirely unavoidable) fight. After that, keeping a finger in the last paragraph just in case becomes essential and keeping a tally of scores seems pointless - the book isn't playing fair. True, RADFM is meant to be a parody, but there's no reason it couldn't be a proper gamebook into the bargain. The people who are going to get the most from this are those who played plenty of Fighting Fantasy books when they were younger. I can't be the only one who wants at least the possibility of taking the dice rolling seriously. Some of the humour will be lost on those who didn't play the originals much or who are unaware of them. You'll be able to identify these people merely by telling them the title of RADFM. If they look at you blankly, you're likely to have some explaining to do. Anyone who so much as smiles, however, will enjoy this book. Conclusion: Amusing rather than genius but worth getting if The Housedad Adventure leaves you wanting more.